If you have been closely following the on-going 5 Pointz litigation, then you know that there was the potential for sweeping implications for visual artists seeking to recover monetary damages for the destruction of certain pieces of artwork by other individuals under the United States Visual Artists Rights Act of 1990 (“VARA”). Last week, the trial phase of the litigation concluded and a judge in Brooklyn, New York awarded the 5 Pointz graffiti artists an unprecedented $6.75 million verdict. This is a ground-breaking decision for visual artists. Let’s discuss how we got there and its potential implications. This story begins in the early 1970s when an individual named Gerald Wolkoff acquired warehouse buildings in Long Island City, New York, a then under-developed high crime neighborhood outside of Manhattan. Wolkoff purchased the warehouses for speculative real estate investment and development purposes, and initially did little to prevent neglect at the buildings. 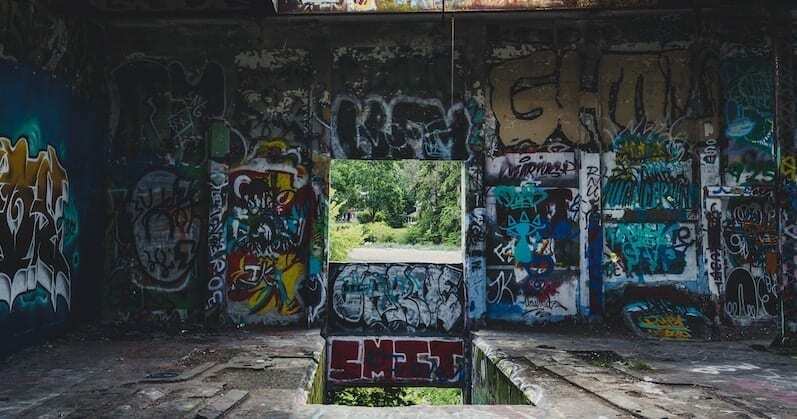 Over the next few decades, the buildings slowly fell into ill repair and became tagged with an assortment of un-coordinated graffiti common in a dilapidated warehouse district. The Street Artists in 5Pointz Brooklyn lost their battle to preserve their artwork. In the 1990s, Wolkoff began leasing some space in the warehouses to visual artists and a variety of art studios popped up, predominantly focused on street art and aerosol-graffiti pieces of artwork. This was a good situation for all parties, as the street artists desired low-rent studios with massive wall space to produce their artwork. Wolkoff, in turn, received a certain amount of notoriety, cash flow, and property security. Over time, a vibrant artistic community developed and the artists began cleaning up the warehouses and adding safety and security measures with relatively no oversight from Wolkoff. The community flourished as an acclaimed location for street art and gained the name “5 Pointz” – an homage to the five boroughs of New York City. Until its destruction years later, it had been said that 5 Pointz was the largest collection of exterior aerosol art in the United States. In the early 2000s, Wolkoff struck up conversations with one of the leading graffiti artists in the area, Jonathan Cohen. Wolkoff agreed to allow Cohen, the unofficial-official leader of the community, to artistically curate the walls at the 5 Pointz site. From there, Cohen and the other 5 Pointz artists developed a system of how the artists could share and use the various walls of the warehouses to more elaborately exhibit their artistic works in an organized fashion. Wolkoff was pretty hands-off with 5 Pointz, and only interacted with Cohen. Wolkoff’s only rules to Cohen were to not display any pornographic, religious, or political artistic works on the walls. Importantly, this agreement between Wolkoff and Cohen was not reduced to writing and constituted an oral agreement. As time progressed, 5 Pointz became a major attraction where locals, tourists, school children, and other creative professionals would come to view the rotating pieces of street art displayed on the warehouse walls. Crime rates went down in the neighborhood due to all the foot traffic. Most artistic works at 5 Pointz changed frequently over time, as the next artist who received wall real estate would remove the prior work and replace it with their own work. However, the 5 Pointz community deemed many pieces of artwork so great, they were anointed a permanent fixture status on the walls and were to remain forever. The artwork gained such notoriety that commercial productions and movies were filmed with the warehouses in the background. In 2011, Long Island City was in the midst of a gentrification construction boom, and Wolkoff decided it was time to cash out of his long-term investment property and develop the high-rise residential towers he dreamed of in the early 1970s. Wolkoff announced plans to knock down the warehouses. In response, Cohen and the fellow 5 Pointz artists started a resistance movement to protect the site and attempted to have 5 Pointz declared a landmark by New York City’s Landmark Preservation Commission. They also tried to raise funds to buy the site from Wolkoff for preservation purposes but were unable to do so given that the property was worth hundreds of millions of dollars. The artist’s attempted protective measures failed. As a last resort, Cohen and the other 5 Pointz artists instituted litigation against Wolkoff and sought a preliminary injunction to prevent the destruction of the warehouses. The artists were denied an injunction by the court and an emboldened Wolkoff whitewashed the 5 Pointz site in anticipation of knocking the warehouses down to build the residential towers. “Whitewashing” is a street art term for rolling white paint over a wall and in the process, destroying the artwork by covering it with new paint. Most, if not all, of the street art at the 5 Pointz site was destroyed by Wolkoff at this time. Notably, while the 5 Pointz artists did lose their request for a preliminary injunction, Wolkoff’s whitewashing occurred prior to the court issuing a written opinion. In the court’s later issued written opinion, the court contemplated that while the court could not prevent Wolkoff from tearing down the warehouses, Wolkoff was nonetheless exposed to copyright claims by the artists if he did tear down the buildings as that act of destruction would destroy the 5 Pointz artists’ artwork and potentially violate their moral rights (i.e., VARA rights). About a year later, the warehouses were demolished and Wolkoff’s new residential towers broke ground. Prevent any destruction of a work of recognized stature, and any intentional or grossly negligent destruction of that work is a violation of that right. As such, VARA is generally interpreted at bestowing a right of attribution and integrity to an author for a work of recognized stature. US courts have interpreted the phrase “recognized stature” to mean an artistic work viewed as meritorious by art experts, members of an artistic community, or other relevant cross-sections of society. VARA will only apply if work is of “recognized” stature. For our present purposes, VARA gave the 5 Pointz artists a legitimate mechanism to bring suit against Wolkoff to prevent the destruction of their artwork, albeit a slim hope for a real victory, as VARA claims were typically construed as not having much power, especially in awarding monetary awards, and at the commencement of litigation, it was unknown whether street art/exterior graffiti works could rise to the level of recognized stature. The plain text of VARA specifically addresses the removal of an artistic work incorporated in or made part of a property or building. On one hand, if the artistic work is incapable of being removed from a location without destroying the artwork, the artist can bring suit to prevent the destruction of the work, unless there is a written agreement signed by the author waiving their VARA rights. On the other hand, if the artistic work is removable from the property without the threat of destruction of the artwork, an owner of the artwork needs to only give the artist 90 days written notice to remove the artwork (at the artist’s expense) or the owner may destroy the artwork without real consequence. All of this is, of course, subject to the date requirements stated in the VARA statute. Returning to the 5 Pointz litigation, at the trial regarding whether the artwork at the 5 Pointz site was of sufficient “recognized stature” to be eligible for protection under VARA, the Honorable Judge Frederic Block of the Eastern District of New York ruled that evidence established a variety of artwork at 5 Pointz achieved a meritorious status among art experts and others in the community and was protectable under VARA. Since the art was of sufficient recognized stature, Wolkoff’s actions in destroying the art constituted a violation of the law and the artists won an award of monetary damages for the destroyed artwork. This ruling was the first of its kind in acknowledging that street art (notably, exterior graffiti art) can achieve a recognized stature under VARA. What Can Be Recovered Under VARA? Under the Copyright Act, which damages provisions govern VARA, damages for copyright infringements vary greatly. Typically, two types of damages are awarded to victors of copyright suits: actual damages or statutory damages. Actual damages are exactly as they sound – what did the artists lose monetarily through the destruction of their work. The Judge determined that it was near impossible to prove the market value of the artwork, and awarded the 5 Pointz artists no actual damages. The other damages scenario is an award of statutory damages, which is a sliding scale of damages that range between $750.00-150,000.00. The more egregious the act by the infringing party, the more statutory damages a court will award per instance of infringement. Statutory damages are typically awarded in situations where it is difficult to establish the value of damage to the infringed party due to the inherent difficulty in valuing intellectual property. For willful copyright infringements, i.e. actions which were intentionally done by the infringing party, statutory damages fall between $30,000-$150,000 per instance and are at the discretion of the fact finder to award in litigation. In this case, Judge Block was the fact finder, as the 5 Pointz artists waived their right to a jury trial. In his discretion, Judge Block found that Wolkoff’s brazen middle-of-the-night whitewashing of 5 Pointz prior to an order of the court being issued was egregious and willful in nature, and assessed a multitude of statuary damages against him, often to the maximum allowed by law to the tune of $150,000 per instance. In total, 45 works on the 5 Pointz site were determined to have recognized stature status under VARA, and Judge Block entered a final decision against Wolkoff in favor of the 5 Pointz artists for $6.75 million in damages. Cohen was the largest recipient of these sums among the 5 Pointz artists, winning over $1.3 million dollars. Notably, the court also found that if Wolkoff had waited until the court’s initial orders were released, and waited to destroy the warehouses until he received all real property permitting, the court would not have found his behavior willful and he would have been subjected to lower monetary damages. In the court’s opinion, Wolkoff made his own bed. Wolkoff intends to appeal this decision, likely on the grounds that this decision has the U.S. Copyright Act basically preempting real property laws. In his view, this judgment theoretically prevents property owners from having an unfettered free reign of how they choose to run and maintain their own personal property. He will face an uphill battle given that Judge Block’s lengthy, well-supported decision, has already been rendered against him, but it is likely this dispute is not anywhere near the end of the story given the significant money involved. While on an artistic level this is certainly a sad story for art lovers and the artists of 5 Pointz as their community and artwork were all effectively destroyed in an instant, this is also a cause for celebration for the twenty-one 5 Pointz artists that received a significant precedent-setting damages award. The case helps establish VARA as a legitimate way to enforce an artist’s rights, especially in the street art community. How Will the 5 Pointz Verdict Affect Other Artists? This brings us to the question of how this ruling impacts other artists. While the $6.75 million award is certainly eyebrow-raising, is important to understand that the 5 Pointz artists were only able to win that amount given the notoriety of the location, the meritorious quality of their artistic works, the initial permission by Wolkoff to allow them to use the warehouse space, the inability of the artists to remove the artwork from the walls without destroying the buildings, the lack of written agreements, and the willful actions of Wolkoff in destroying the artwork. If any of those elements had been missing, this case would very likely not have had such a sensational damages award. It is unlikely that most artists would be able to recover damages under VARA unless the situation was substantially similar. However, the good news for artists is, VARA is a legitimate arrow in their proverbial quiver in attempting to enforce artistic rights against property owners. As stated, this does not mean anyone can pick up a can of spray paint, spray something against a wall, and all of a sudden be able to claim a multi-million dollar VARA violation – vandalism is likely not protectable in such a scenario. But, one practical benefit may be that artists who have installed artwork on another’s property with the property owner’s consent and that is incapable of being removed without destroying the artwork now have escalated threats of VARA claims against the property owner. This could include other street art or graffiti works displayed on a warehouse wall. This is likely to cause a short-term windfall to artists who have oral agreements similar to the 5 Pointz artists or written agreements with property owners without VARA/moral rights waivers, as property owners may want to negotiate a VARA waiver with the artist (i.e., pay the artist) so that they do not end up in a similar situation such as Wolkoff. Alternatively, this ruling can be viewed as a double-edged sword against artists for the same reasons. The 5 Pointz litigation was heavily publicized, and the monetary decision by the Judge is truly ground-breaking and precedent-setting. Property owners who commission pieces of art for their property are now on notice that without a written VARA waiver, they could be liable to artists for the destruction of artwork on their property. Artists can readily expect VARA waivers to be included in all new artworks commissioned on private property, which, from a legal perspective, is giving away a right one possess as a matter of law. From a practical perspective, this means a property owner will likely have a greater ability to destroy an artist’s artwork. The long-term impacts are yet to be seen, but some hypothetical worries are that property owners may not commission art for their properties or prevent the development of future artistic communities for fear of VARA claims. We will have to see what happens if/when Wolkoff files an appeal, but regardless of the outcome, artists should be understanding the basics of their VARA rights when negotiating situations such as installing art placements on another’s property.